Lanius torquatus Latham, 1802, Port Jackson (Sydney), Australia. Three, possibly four subspecies; one large and dark with reduced white in wing in Tasmania (Cracticus torquatus cinereus), another small and dark with reduced white in wing in coastal southeastern Australia between the New South WalesQueensland border and Melbourne (nominate torquatus), and a third (that may comprise east and west forms) small and paler with extensive white in wing throughout southern and inland Australia from the west coast to coastal Queensland south of Cape York Peninsula (C. t. leucopterus). 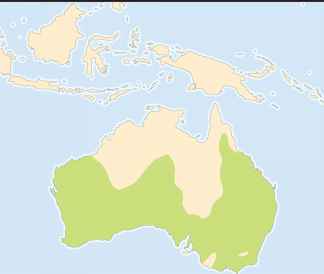 The gray butcherbird forms a superspecies with the silver-backed butcherbird (C. ar-genteus) of northwestern Australia and the black-backed butcherbird (C. mentalis) of Cape York Peninsula and dry sectors of southeastern New Guinea. 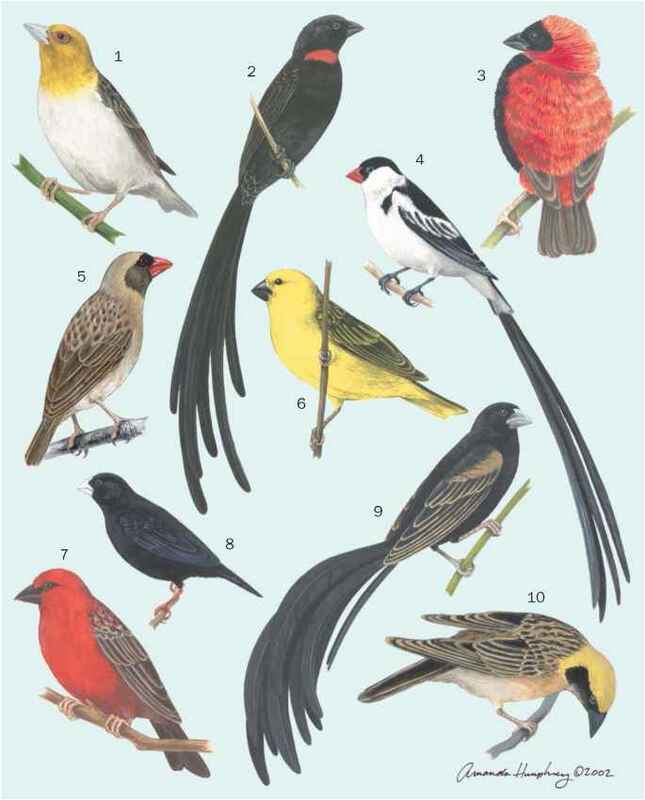 French: Cassican a collier; German: Graurücken-Würgatzel; Spanish: Pájaro Matarife Gris. 10-12 in (25-30 cm); 2.8-4.0 oz (80-110 g). Medium-sized bull-headed bird with tapered body and black-, gray-, and white-patterned plumage. Head black with white lore spot (between eye and upper bill) and collar, back gray, rump white, tail and wings black with white tips and stripes respectively, and undersurface uniformly grayish white. Eyes dark brown, feet gray, and bills bicolored, with black tip and gray-white base. Females are usually grayer breasted and shorter billed than males. Juveniles dull-gray-billed and dully patterned, with dusky-olive and speckled upperparts and yellowish underparts. Most of southern and inland Australia north to 20°S, including Tasmania but excluding treeless deserts. Closed woodland and open forest of eucalypts and acacias, including mallee (Eucalyptus) and mulga (Acacia) scrubs, where the space between tree crowns is about the size of the crowns themselves. Densities range from one bird to about 12 to 49 acres (5-20 ha) in suitable habitat. Retiring and solitary, in pairs or small family groups, gray butcherbirds live in the mid- and upper strata of trees, spending much of their time perching still and coming to ground only to pounce on prey. They are sedentary, with pairs holding the same territory, 20-99 acres (8-40 ha), year-round, with a larger home range. Both male and female duet antiphonally in songs of fluted whistles and ringing caws, which are also given in alarm and aggression. Gray butcherbirds are raptorial perch-pouncers, watching from tree perches at 6.5-40 ft (2-12 m) up, then swooping down to ground or branches to snap up prey, which is mostly insects but also small birds, nestlings, reptiles, and mice. Fruit also contributes to the diet. Food is carried back to perch, wedged in crannies or forks and torn apart with the bill for eating; the small weak feet are not used for tethering prey. Monogamous, forming pair bonds in breeding territories reinforced by much duetting during early breeding. Gray butcherbirds breed mostly between July and August and December and January throughout their range. The nest, a rough but tight cup of twigs lined with finer, often reddish fiber, is placed in upright forks in outer foliage at 10-50 ft (3-15 m) up and takes about four weeks to build. Eggs, in clutches of three to five, are 1.20-1.25 x 0.85-0.95 in (30-32 x 22-24 mm), brownish green, and finely freckled in red-browns, often in a zone around the larger end; they hatch in 22-24 days. Female builds nest and incubates unaided, while the male defends territory. He may assist her in feeding young, which fledge around four weeks. Usually, only one brood reared per year. Not threatened, although many populations have declined locally because of habitat clearing and alienation.